You are here: Home > ‘It’s going to be a hot Indian Summer’: Secwepemc Women Warriors call land defenders to B.C. Members of the Secwepemc Women’s Warrior Society are calling land defenders and warriors to British Columbia, where prominent Secwepemc Ktunaxa land defender Kanahus Manuel was arrested Saturday morning while asserting Secwepemc title and rights and resisting the Trans Mountain pipeline expansion project. 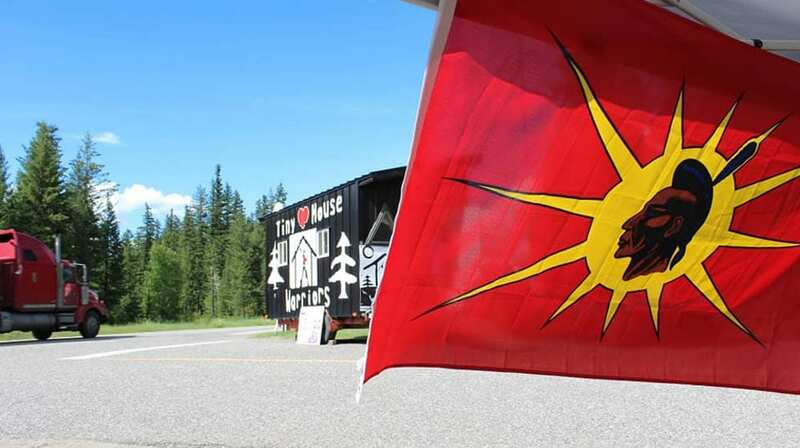 At around 10 a.m. Manuel live streamed a visit by RCMP to North Thompson Provincial Park in Secwepemcul’ecu — the unceded Secwepemc territory in what is now interior B.C. — where she and others had reoccupied a former Secwepemc village inside the park. Manuel and her fellow land defenders said their people have never signed a treaty or otherwise collectively given Canada or the province of B.C. permission to settle or use their territory. 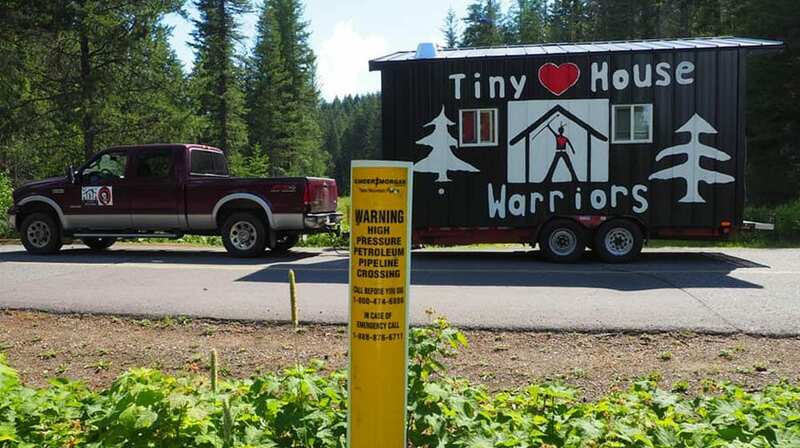 “Justin Trudeau has left us no choice,” Manuel said in a July 11 press release from the Tiny House Warriors—the name she and other land defenders are using to describe the mobile tiny houses volunteers have built as a feature of their resistance movement. Manuel, a traditional tattoo artist, mother and midwife, led a tattoo gathering at the park last weekend as part of an ongoing effort to celebrate and revive the important tradition. But when the weekend came to a close she and several others stayed. On Friday Manuel was served with an eviction notice from B.C. Parks. 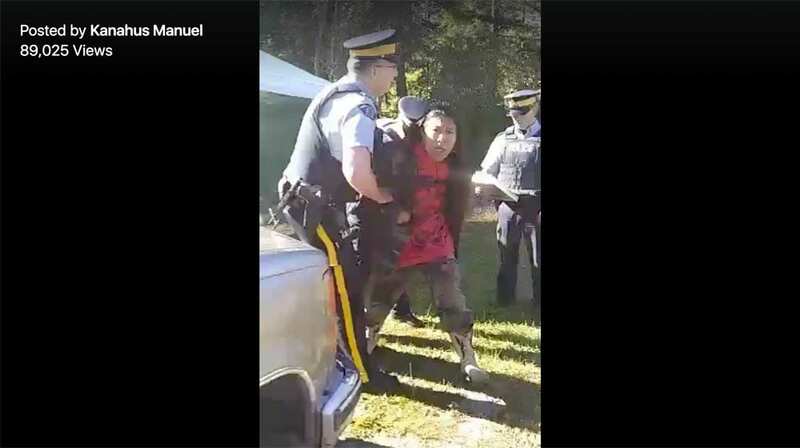 The RCMP officers, about an hour after they asked the group to vacate the park Saturday, arrested Kanahus while her sister Mayuk filmed the arrest. Kanahus shouted that the land defenders were already in the process of packing up to leave. She also issued a call to warriors across Turtle Island. She also addressed federal Justice Minister Jody Wilson-Raybould, who she said “has to respect Secwepemc law, and she has to respect Indigenous title and start respecting and acknowledging our Indigenous title. The B.C. NDP won last year’s provincial election on a platform that acknowledged the Supreme Court of Canada’s 2014 Tsilhqot’in decision. “Three years ago, the Supreme Court of Canada set down law on the legal rights of First Nations people in this province,” the platform read. “The message was clear: Aboriginal Title and Rights are a matter of law and justice. The province, like Canada, has promised to implement the Truth and Reconciliation Commission’s calls to action, and to implement the United Nations Declaration on the Rights of Indigenous Peoples, which include the right to self-determination and for Indigenous people to live on their own lands by their own way of life. APTN has reached out to B.C. Premier John Horgan, B.C. 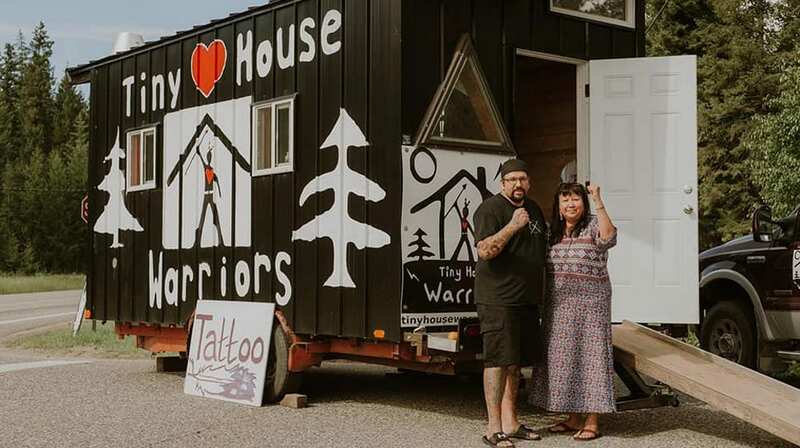 Minister of Indigenous Relations and Reconciliation Scott Fraser, and Wilson-Raybould for comment on the Tiny House Warriors, but none responded by the time of publication. More than 500 kilometres of the controversial Trans Mountain pipeline expansion project runs through unceded Secwepemc territory, just the latest industrial project locals say threatens their land and waters, ignores their inherent Aboriginal title to their land and violates their Indigenous rights. While four of the 17 Secwepemc bands established by Canada under the Indian Act have signed agreements to allow the pipeline through their territory, the Secwepemc Women’s Warriors Society and others maintain Kinder Morgan and Canada do not have collective Secwepemc free, prior and informed consent. The Trans Mountain pipeline has faced extreme opposition from the Government of British Columbia and many First Nations whose territories it is scheduled to run through, or whose lands and waters it will impact. If built, the pipeline will transfer up to 890,000 barrels of diluted bitumen from Alberta to Burnaby, three times the amount already flowing from the tar sands to BC’s coast, and lead to a significant increase in tanker traffic in the Salish Sea and coastal waters. Trudeau has staunchly supported the project despite opposition from First Nations in Alberta and B.C., the B.C. government and the Treaty Alliance Against Tar Sands Expansion, a coalition of First Nations across the country. “Now is the time to stand beside Indigenous people in support of our timeless struggle to defend Mother Earth,” Union of B.C. Indian Chiefs Grand Chief Stewart Phillip has said. The pipeline also faces a number of legal challenges currently making their way through the courts. Facing a host of uncertainties, Kinder Morgan, the Texas oil giant that owns the pipeline, suspended non-essential spending in early April and announced it would give Canada until the end of May to secure an agreement of the province of BC and secure certainty for the project. In a recent interview with APTN, D.T. Cochrane, an economist and researcher with the Indigenous Network on Economies and Trade, said Canada’s purchase of the pipeline and its hopes of selling to private investors are “untenable” due to the outstanding issue of Aboriginal title on unceded Secwepemc and other First Nations’ lands. Cochrane said that local Indigenous resistance to the pipeline, which is led by grassroots people and Indigenous and non-Indigenous allies in B.C. and across Canada, makes the project’s “unquantifiable risk” the “death for any potential asset. “If you cannot assess the risk of an asset, you cannot price an asset – so how could investors possibly back that asset?” Cochrane said. Following her arrest Saturday Manuel was held at an RCMP detachment in the nearby town of Clearwater and later released from custody. Late Saturday evening she posted another Facebook live video, and said she was “being held captive as a prisoner of war here in Canada,” but that she was released on conditions she “signed under duress facing this war against us for our lands and our freedom here in Secwepemcul’ecw. “We are on Highway 5, five kilometres south of Clearwater and we’re asking everybody to join us,” she continued. “We are going to be on the move — we’re stopping pipelines. That’s why we’re here. We are pipeline fighters. We’re land defenders. We’re water protectors. We’re the Indigenous women of this land. We are the title holders to this land. We are the mothers. We are your sister. We are your aunties, and we are your Godmothers. 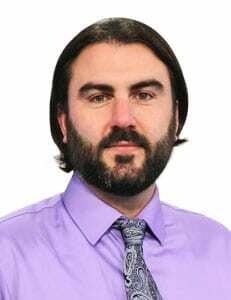 At a May 2 press conference announcing the Chiefs of Ontario, who represent 133 First Nations in that province, were joining the Treaty Alliance, Squamish Nation councillor Khelsilem predicted the Indigenous-led resistance to Trans Mountain would be big. “I think we’re seeing the beginning of what will become the largest civil disobedience in Canadian history,” he said. Last month the Edmonton Journal reported former Bank of Canada Governor David Dodge said at an event in Edmonton that “we’re going to have some very unpleasant circumstances,” and that “there are some people that are going to die in protesting construction of this pipeline. We have to understand that. Manuel and many others maintain Canadian laws used to force unwanted development on unceded Indigenous lands, including the use of force to physically remove Indigenous people from defending their lands and waters, do not respect the Supreme Court of Canada’s own rulings or international law. “Nevertheless, we have to be willing to enforce the law once it’s there”….. Under the UN Convention on Indigenous Rights, indigenous peoples have the right to an independent vote to determine their support or rejection of settler projects on their traditional territories. Such a vote would be through the cooperation of the UN’s ILO responsible for the supervision of such a vote. A vote would determine what the law is! It would prepare the way for Canada to be sanctioned via the Security Council. I wonder what they put in their gas tanks there, those gas-guzzling double cab trucks? I wonder what they used to power their cellphones and video cameras? I wonder how they heat their homes? Keep their fridges running, their stoves working, their tvs, digital gadgets? A lot of that is achieved with hydrocarbons….. That’s the point! There are alternatives today that we should be investing in to help get the Planet and us through this transition…. Duh! That’s getting old. Nothing original from trolls. All repeat each other ! Something that has escaped attention is that two sections of the new pipeline were already built around 2008. One of these is near Blue River, and the other, called the Anchor Loop, stretches from Hinton to the west end of Jasper Park. Surely these would not have been built unless Kinder Morgan was certain the rest of the line would be allowed. And this means that the whole environmental review process and First Nations consultations were a sham. It is not a new pipeline they are protesting, it’s merely the twinning of an existing pipeline, that has already been around for 50 years so probably longer than the whiners. It’s a twin line, not a new pipeline so the loud protest is a publicity stunt + a nuisance at best. Certainly not a valid land claim by indigenous people.